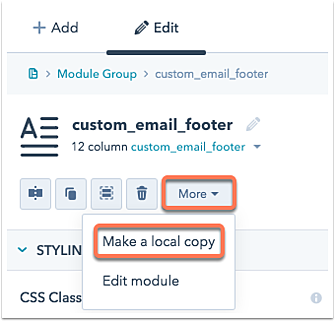 To edit a single instance of your global module, you can make a local copy of the module on a particular template. Please note: this feature is only available for individual global modules, not global groups. In the left pane, locate and click your template. Click the global module to make changes to on this template. In the right inspector pane, click the More dropdown menu and select Make a local copy. Click Make a local copy. This creates a copy of your module and so you can make changes to the module that only appear in the template you are editing. Customize your module as needed.